Planet Leicester Bakers offers a number of exciting bread services for private individuals, organisations and businesses to enjoy. As a business with social purpose, services on offer support the community work of Planet Leicester Bakers. Planet Leicester Bakers will work with you to develop bespoke activities that meet your needs. Please contact Michelle to start a conversation about bread and what it can do for you, your family, friends, clients and colleagues! From just £85* you can enjoy the wonder of creating loaves and buns of fresh homemade bread in the comfort of your own kitchen. 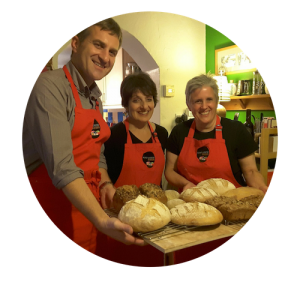 Michelle will come to your home with the necessary equipment and spend 4-5 hours with you, creating and working dough, shaping loaves and cobs and sharing knowledge. This personal workshop is perfect for complete beginners or those who have tried to bake bread before but not been happy with the results! The price includes the ingredients, recipe sheets and certificates. *Small additional travel costs may be added depending on distance. Hi Michelle – Loved our workshop on Monday, thank you! Lesley, who trained with husband Barry. 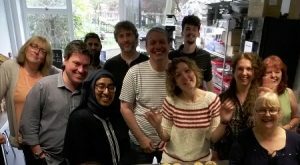 A whole day introductory training for home bakers in sourdough and slower dough at Planet Leicester Bakers, LE4. For individuals or pairs this full 7-8 hour day of baking gives you an introduction to the lovely world of wild yeast and slower dough. During the day you will bake 5 different breads, including a flavoursome Dutch Oven loaf and rye and wheat sourdoughs. You will learn about building and maintaining your own sourdough starters and have the option to take home some healthy wheat and rye starters from Planet Leicester Bakers. It is a full day immersed in the most natural and least processed of breads. It includes refreshments, recipes, tasty simple lunch and all bread you make to take home. It is priced at £170 for one. £250 for two. The maximum limit of two people makes it a lovely day of personal tuition. For Business, Charities, Social Groups, Schools and more. The chance to take part in an activity that encourages close working and peer support. The opportunity to learn a new skill that can benefit their physical and mental well being. Time away from the day to day work environment, leaving them refreshed and re-engaged. Increased awareness of slower, good food and the benefits of preparing and sharing it with others. Sessions can be tailored and planned in partnership with your business or organisation. 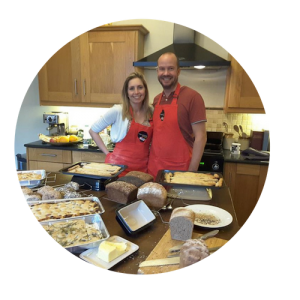 If necessary, Planet Leicester Bakers can recommend community kitchen and meeting room space – from community centres to windmills. Team bonding over the scales. The day can incorporate business activities into the bread making process if you wish. Also, staff take away the fresh bread they have made from scratch, giving a real sense of pride and achievement. Planet Leicester Bakers is available for talks, presentations and demonstrations to suit your audience. Another of the bread services on offer. 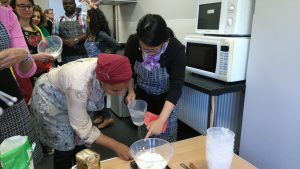 Whether it’s about bread and the science of bread making, establishing a business with a social purpose or innovation in local community work, the focus can be made to fit your audience or group. And it can include activities to get imaginations and interest in bread fired up! “Many thanks for coming to see us, we really enjoyed the talk. The bread was delicious! Contact Planet Leicester Bakers to start a conversation about tailoring any services to your needs.